For a business meeting over a cocktail, curling up by the fireplace with a book or a spot of relaxation in the Nuxe Spa, come and share a special moment with us. 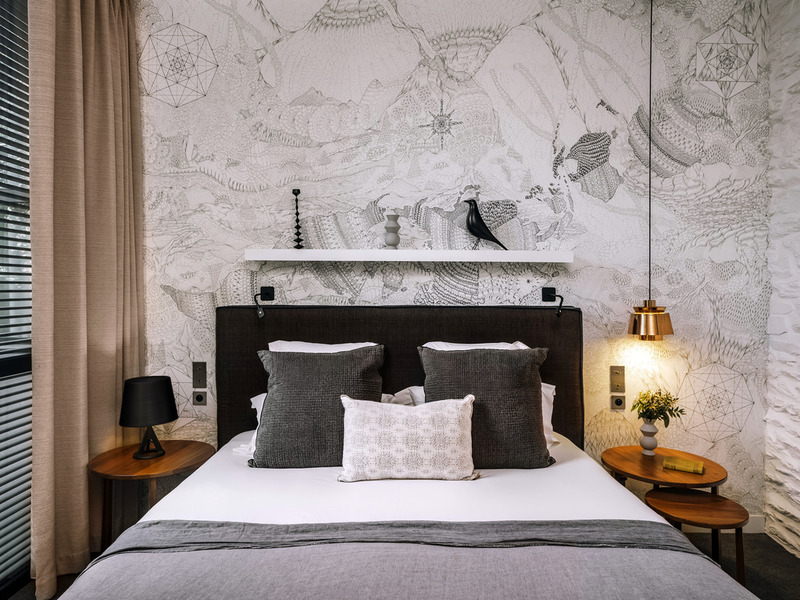 The Balthazar hotel is located within the heart of Rennes, a city of art and history. Enjoy a personalized welcome in unique, cozy and contemporary surroundings which play with contrast: urban and rural, shared and private, etc. ..
For moments of absolute serenity, indulge yourself in Nuxe Spa's exceptional facilities. Bay windows, fanciful lights and a wall of greenery... the patio is the essence of Balthazar. In the center of Rennes, the luxurious Balthazar Hotel & Spa MGallery by Sofitel welcomes you into its unique atmosphere. Discover all the facets of this 5-star boutique hotel that harmoniously blends history and modernity, nature and urbanity. 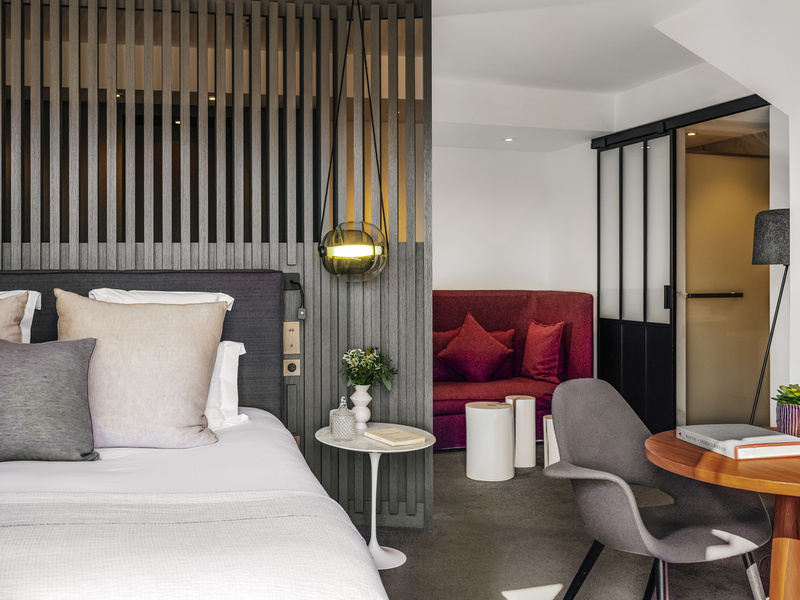 Behind the elegant façade of two former townhouses, this contemporary hotel reflects the energy of the Breton capital, where life reverberates within traditional half-timbered homes. Stroll medieval streets and admire the nearby Parliament of Brittany. From the leafy patio to your guestroom or suite, the Balthazar charms you with its elegance and creativity. Soft hues and pure lines are found alongside surprising decorative touches. Be seduced by the personality of this design hotel in the city center. The capital of Brittany does not offer typical French heritage. No visitor can miss its Celtic soul. Today, Rennes is a young city that is proud of its Breton identity. In the heart of the city, 5 min from Rennes station and 15 min from Rennes St. Jacques airport, 2 min from the Liberté events hall and a 2 min walk from the République bus station. Approx. 3 hrs 45 min from Paris via the A11 then A81 highways, 1 hr 30 min from Nantes via the N137 and 2 hrs 45 min from Brest via the N12. Follow signs for Rennes Centre then Liberté, Rue Maréchal Joffre is a bus route with restricted access for residents. Follow the road from Boulevard de la Liberté, we are number 19. 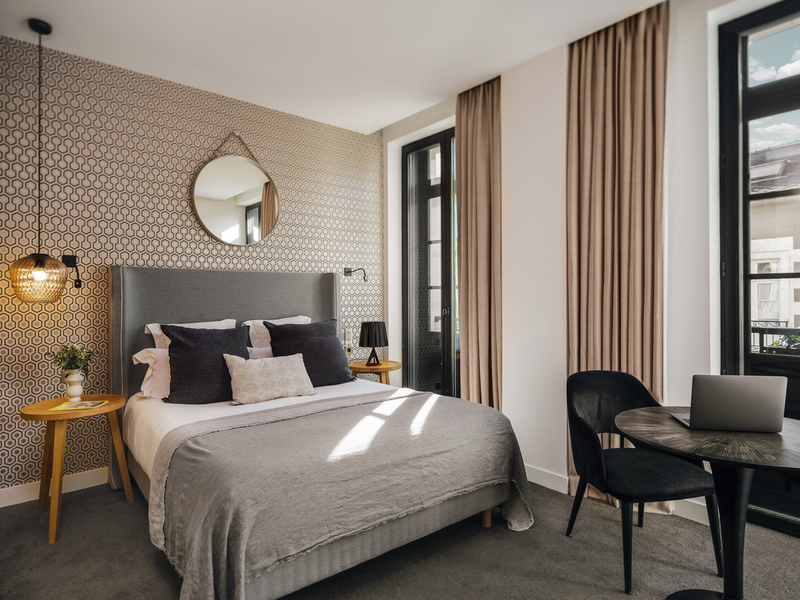 The Balthazar Hotel features 54 rooms and 2 DELUXE SUITES with private terraces with views overlooking downtown Rennes. Comfortable and elegant, the rooms are decorated in a simple, modern and warm style. Soft colors, designer furnishings, unique decorative elements... you are transported yet feel at home in the Junior suite. From the lounge to the immense terrace overlooking the city, these contemporary spaces are the quintessence of chic urban life. SUPERIOR ROOM with 1 Double Size Bed or 2 Single Size Beds, overlooking the patio. For an intimate meal or gourmet break in total peace and privacy, let room service bring breakfast, dinner or snacks to you. Savor the hotel's gastronomy, prepared with local products, without having to leave your room or suite. La Table de Balthazar offers a comfortable, stylish ambiance. Our chef, Anthony Le Fur, and Michel Rostang have developed a delicious menu based on fresh local produce. At the bar, discover the original creations devised by our mixologists. Our bar invites you to discover excellent wines and creative cocktails. For a delicious Sunday treat, experience our housemade crêpes and "galettes-saucisses". La Table de Balthazar revisits the cuisine of chef Michel Rostang using local products. The Balthazar offers a buffet brunch on weekends. The warm and cozy Balthazar bar is the perfect place for socializing, whether for business meetings over coffee, afternoon tea or enjoying delicious cocktails with friends in the evenings. Organize your business meetings, incentive events or seminars in downtown Rennes. 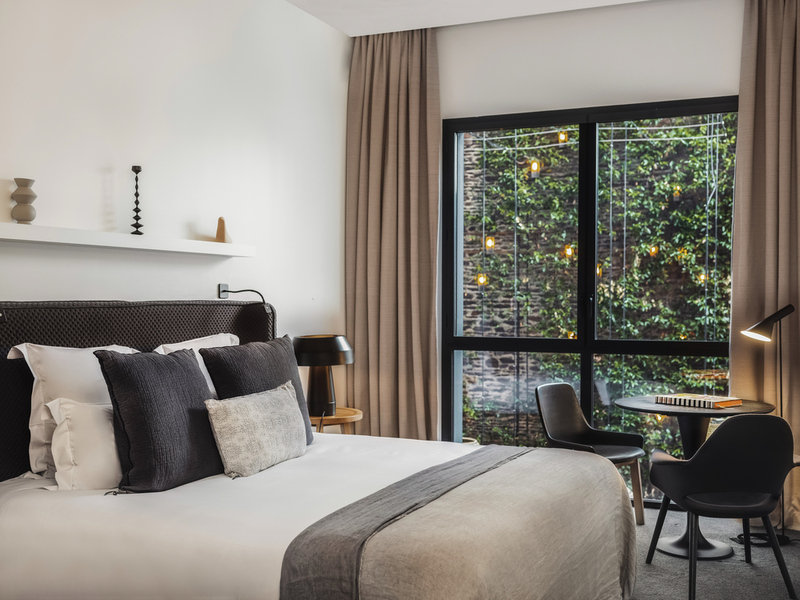 The Balthazar Hotel & Spa has two rooms suited to your business needs, offering comfort, quality service, the latest equipment and more. Small meetings, interviews, presentations? Choose the Balthazar lounge! Our services include coffee breaks, a bar, lunch and dinner. We can also offer quality catering and accommodation options. As the big day comes to a close, the newlyweds and their guests are just a short distance from their rooms. A bridal suite for the newlyweds with a four-poster bed... a chance for the couple to make the romantic moment last. With terraces, swimming pools and gardens, the boutique hotels in the MGallery collection provide an idyllic setting for cocktails and receptions. They offer guests truly beautiful surroundings. Guests are offered menus of imaginative cuisine and local produce. Prepared by top-class chefs, they will help to make your special day unforgettable. Our Nuxe Spa offers a superb sensory swimming pool, steam baths, a sauna, an amazing ice fountain and an experience shower. We also offer 4 treatment cubicles, including a double, for treatments and massages. Guests love the Balthazar Hotel's Nuxe Spa, bar, restaurant and patio for their unique and contemporary atmosphere. Room service, valet parking, etc. During your stay, our teams offer every care and attention. Golf Blue Green Rennes Saint-Jacques, the largest golf complex in Brittany, has a championship course renowned for the speed and the quality of its greens, a 2262-yard (2068-meter), 9-hole course and a short 9-hole course. During your stay, make the most of the fitness room with modern equipment to stay in shape. Open 24 hours a day, this room is renowned for its immaculate décor and relaxing atmosphere, a stone's throw from the Nuxe Spa.